Honda Motorcycle and Scooter India Pvt. Ltd has laid the foundation stone for futuristic sports infrastructure under multiple CSR initiatives to empower the Kolar city of Karnataka. The installation of 1,100 LED lights is going to escalate city infrastructure to many years ahead of its time. Honda Centre of Excellence established at Kolar will benefit the local community with several skill development programs. The multipurpose stadium aims to provide long term sustainability and health welfare to the community, expecting to benefit more than 2000 people locally. The stadium will be equipped facilities like – robust boundary walls, national level running track, toilets and pavilion. The Bhoomi Poojan ceremony was graced by the presence of Shri K.H. 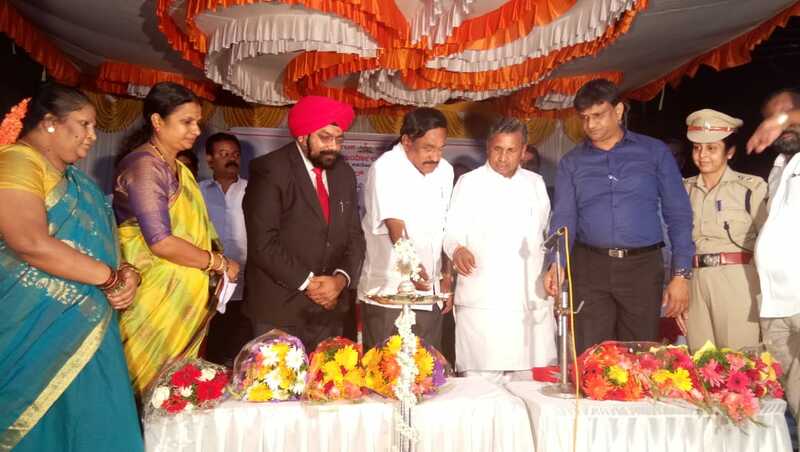 Muniyappa, Member of Parliament, Kolar; Shri Srinivas Gouda, MLA Kolar and Ms. Roopa Shashidhar, MLA Kolar; Shri Manjunath, District Collector of Kolar & Mr. Harbhajan Singh, Director, General & Corporate Affairs, Honda Motorcycle & Scooter India and senior dignitaries from City Municipal Council and media personnel. Taking a proactive step to further advance Kolar city, Honda has facilitated the entire city with 1100 LED lights. The facility has provided safety quotient to the residents and will also become the driving factor for local economy. Honda Centre of Excellence at Kolar was inaugurated on 25th Aug’ 18. Aligned to Sustainable Development Goals (SDG’s), towards ‘Decent work & Economic Growth’, the company has focused their CSR initiatives to skill the local youth in field of stitching, sewing, beauty, computers, 2Wheeler technician courses, supervisor & advisory courses. Honda ventured into 3 new courses looking at the need of the area such as Mig Welding technician, Beautician and Electrician courses. These courses are NSDC approved, and run by Labournet Services India Pvt. Ltd. So far 4600 youth including 1600 women have been skilled up to earn their own livelihood. Honda has constructed multipurpose outdoor stadium at Malur, Kolar & Indoor stadium, Kolar for sportspersons; conducted free medical test under Healthcare to Hut in 27 villages near Narsapura & covering 10,000 plus beneficiaries; set up Honda Centre of Excellence at Kolar & train youth and provide livelihood opportunities; constructed Clean drinking community water RO plants in 20 villages near Narsapura; constructed overhead water tank of 50 thousand litre capacity in Karinayakanhalli village; constructed road for commutation, Karinayakanhalli village; provided aids & assistive devices to the person with disabilities in Kolar, Malur taluk and Project Harit Udaan for local farmers in Srinivaspura.